Unusual early map of the North Atlantic. 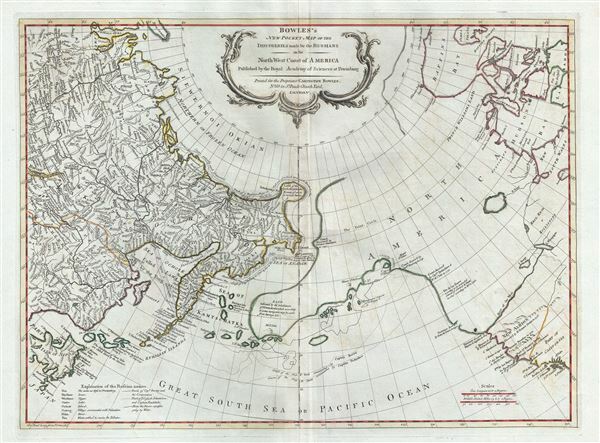 Bowles's New Pocket Map of the Discoveries made by the Russians on the North West Coast of America Published by the Royal Academy of Sciences at Petersburg. A scarce Bowles and Carver example of Thomas Jeffery's seminal map of the North Atlantic, including th Pacific Northwest, Alasaka, and northeastern Asia. The map covers from the Arctic Circle south to the latitudes of Vancouver and Japan. Jeffreys' intended this map to illustrate the explorations of Bering and Tschirkow, several anonymous Russian Voyages, and the travels of the Cossack Schestakow and Captain Panlutzki overland through Siberia. The western coast of the America's is particularly interesting - especially the uncanny Alaska-like projection extending westward towards Asia. Apparently this map was intended as a pocket map, but the present example is offered in folio form.